This page is meant to help you get to know us better here at Sunday School Center. And we'd like to get to know YOU better as well! Tell us about you and your ministry! We'd love to hear about it! Please Contact Us! If you have used materials from Sunday School Center in the past, please tell us how they worked for you! Thanks, in advance, for contacting us! It will help us in the future to provide YOU with more materials that you can use! We also invite you to read our Belief Statement. Yep. 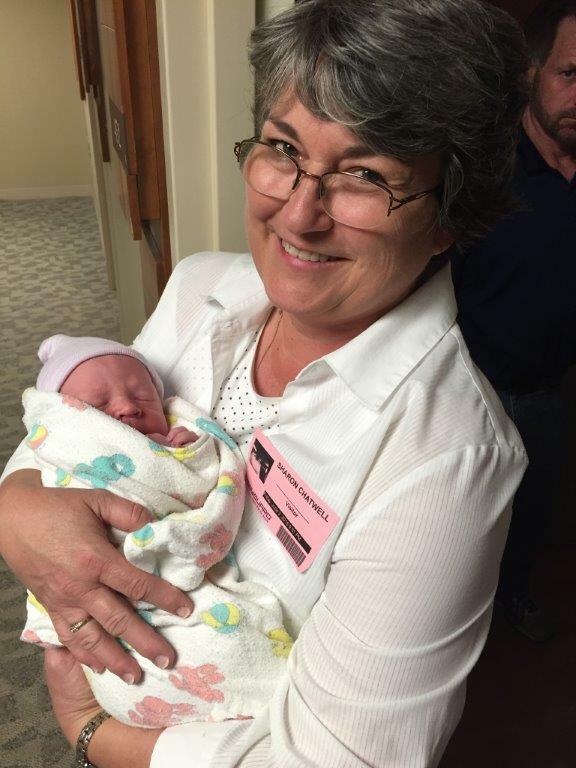 That's me, Sharon Kay Chatwell... holding our new grandson, Benjamin! Born and raised in Texas, I now live in Nebraska with my husband, Rick, and our four children: Chris, David, John and Anna. Two of our sons are married now and their lovely brides have been a wonderful addition to our family! In 2016, we were blessed with the birth of our first grandchild! My husband and I met and married nearly 35 years ago while we were classmates in medical school. I am not currently in practice as a physician, having decided early on to stay at home with our young family. The children are all grown now. And so I find that...I have less to do, and more time to do it in! This afforded me the opportunity to launch Sunday School Center! 25 years ago, I realized that I wasn't getting to listen to the sermons at church... oh, I was there alright... I was just so distracted by my own children that I couldn't pay attention to the preacher. You see, they were "too old" for the Nursery, but "too young" for the Sanctuary. What was I to do? "How about if we start a program where folks like me teach Bible stories and do activities with kids this age during the worship services?" He thought it was a great idea and told me that he'd been "wanting to start a Children's Church for some time," but hadn't had anyone to organize it. I was delighted and volunteered on the spot. I just had one question... "What's a Children's Church?!!" Within 4 weeks we had our program for "Little Guys" up and running. We included children who were 4 - 7 years old. It was fun organizing and teaching it, and I got to write the lessons too! I had always loved writing! This gave me a chance to do something special with the gifts that I knew God had given me. The children responded well to the materials and soon they began enjoying their time in Children's Church! Their parents seemed happy too! So began my journey of writing Bible lessons for children and teens. As I continued to work in ministry with children, God provided opportunities for me to use my gifts and talents organizing programs and supervising volunteers. All the while, I kept on teaching and writing lessons for my classrooms. Eventually, other teachers began using my materials as well. It was a great thrill to learn that others could use things I'd written to teach children about Jesus!! At various times I served as Sunday School Superintendent, Children's Church Director, Christian Education Board Chairman, and VBS Coordinator. And I believe I have taught every single age group of Sunday School class, from the youngest children to the oldest adults! But I think my first love remains teaching Little Guys in Children's Church, just like I did at the beginning! Along the way there were many other opportunities for me to use my writing skills. I wrote fun things like Christmas skits and Easter pageants...and usually ended up directing them, too! In the past 25 years I have written dozens of skits, lots of VBS programs, and hundreds of lessons for children and teens. That's what got me thinking... Why not share with others some of the materials I'd written? There had to be folks out there looking for resources and ideas to use! Why not design a website that would help meet those needs? My dream was that it would be a hub of information for people serving in Sunday School or other Christian ministries. We decided to call it Sunday School Center, and our motto became "Serving Others, Serving Christ." In a lifetime of writing, one is bound to end up with a few boxes of written materials. The question is what to do with them. It is our plan that there will always be free Sunday School lessons and materials offered at Sunday School Center. If you will write to us, using our Contact Us form, and let us know what you are interested in seeing on the website, we'll be sure to let you know when we have it available. Come back and visit us often! It is my prayer that at Sunday School Center you will always find reliable resources, helpful advice, and encouragement in Christ! May God continue to bless you in your endeavors!